After a late spring and challenging conditions during the first week, I am pleased to report that things are looking up and moving in the right directing. The Bonaventure is starting to produce and we’re seeing fresh salmon enter the river, our lower pools are now holding fish. The Grand Cascapdia is also beginning to fish well and nice fish are being landed each day. The Petite opened on Friday, even though its still early for the Petite Cascapedia, our guides did see a few fish here and there. That’s great news as the Petite is usually a later river than the Bony and Grand. Long time friends and Camp Bonaventure regulars Mac & Dale Fox are back in full force for another season. Great to see you guys again!!! It didn't take Mac long to land his first one of the season on Poirier pool ,congratulations Mac well done! 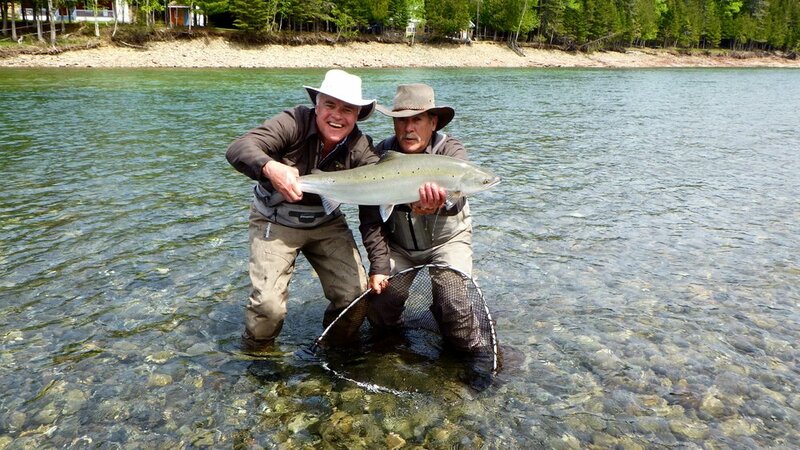 Dale wasn't far behind with another fine silver salmon nice one Dale, way to go! 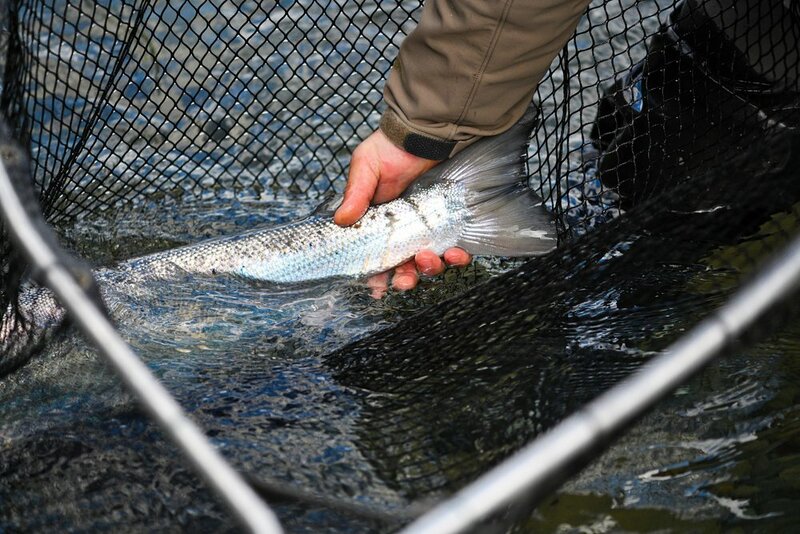 Our rivers are in great condition and water levels are perfect for early season. The Bonaventure is flowing at 55 cubic meters a second so wading is not yet safe everywhere. Spey rods work well and certainly give you an advantage over single handed rods in higher water conditions. Fishing from canoes is the best way to fish at the moment and probably will be for the next week or ten days.The Grand Cascapedia is running over 50 Cubic Meters per second, just perfect for this time of the season. The Petite Cascapedia is in great condition flowing at 30 Cubic meters per second. Adrien Overall from the UK with his first Bonaventure salmon, nice one Adrien, congratulations! We've been seeing fresh fish in the Bonaventure for the past week and Poirier pool was our biggest produce . Our upper pools have also produce a few nice salmon and it should just keep getting better during the next week. The first couple of weeks are sometimes bit more of a challenging, some years are great while others are a bit slower. The good news is, we do have salmon in the river! Opening week can be cool, Julie Talleman braves the elements she fishes the Grassy pool. The fly's of choice this time of the season are usually bigger, this week we had action on the Green Spey, Silver Rat and John Olin. Sizes from 4 and 6 were the best choice. It's still a bit early for dry's but as the water warms up there will be close by. Our good friend and Camp Bonaventure regular Marcel Caissie puts one back on the Bonaventure. ( I vouch that this is Marcel's hand, lol ) congrats Marcel ! That's all to report for this week, If you are interested in fishing with us next season please contact me early, we fill up quickly.